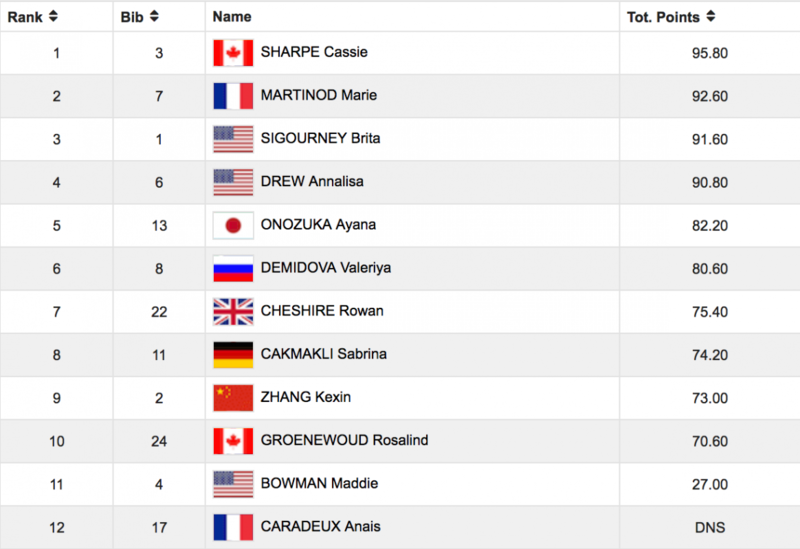 The Olympic gold medal in women’s ski halfpipe has been clinched by Canada—or rather by one Canadian, Cassie Sharpe, who skied to a dominant win in today’s contest at Phoenix Snow Park, South Korea. Looking right at home in the Olympic pipe, Sharpe grabbed lofty 900s in both directions, included a switch trick, and added a great cork 1080 with a tindy grab at the end of her run for the day’s high score of 95.8. She’s joined on the podium by France’s Marie Martinod, the “grande dame” of halfpipe skiing, who won her second Olympic silver medal with a run that’s ingrained in her DNA—left 540 safety, right 540 reverse mute, left 900 safety, flair, and capping things off with a well-executed left cork 10. It’s a worthy capstone to a remarkable ski career that Martinod will be leaving behind (for the second time) after this Olympics. But who knows—she’s skiing so consistently, maybe we’ll see her in 2022 again! A battle emerged between Americans Brita Sigourney and Annalisa Drew for the bronze medal. Drew brought her signature amplitude, big 900s and a 1080 in her final run, bumping Sigourney into fourth. But Sigourney answered by landing her best run of the day, going bigger on all her tricks, including a massive cork 900 tail, and grabbing everything clean to reclaim her podium spot with a score of 91.6. It was a bitter day for defending gold medalist Maddie Bowman, who in all three of her runs couldn’t put down a rightside 900 on her last hit to seal the deal. It’s also a disappointing day for Anais Caradeux, who didn’t start in the finals, as well as for Austria’s Lisi Gram—who sitting in 13th place, could have taken Caradeux’s starting spot. Other highlights included the skiing of China’s Kexin Zhang, who stepped up her run from the qualifying round with more amplitude and technicality, and showed that she’ll definitely be a competitor to be reckoned with in the future. And Russian Valeriya Demidova put on a surprising performance as well, adding a nice seatbelt japan grab into an alley-oop air and linking clean switch and forward tricks for a sixth-place finish, the best result for any Russian, woman or man, in ski halfpipe.